The following report is from Xinhua Net. 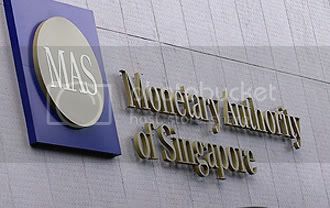 SINGAPORE, July 16 (Xinhua) — The Monetary Authority of Singapore (MAS), the country’s central bank, said on Thursday that it has suffered a net loss of 9.2 billion Singapore dollars (about 6.43 billion U.S. dollars) in the last financial year ending March2009. The loss represents about 3.5 percent of the central bank’s average total assets, the MAS said in a press conference to unveil its annual report. In the previous year, the profits stood at 7.44 billion Singapore dollars (about 5.2 billion U.S. dollars). Against the tumultuous external backdrop, the Singapore economy contracted sharply, posting an output loss of around 10 percent from its peak a year ago, the steepest decline in its history, by the first quarter this year, it added. For the economy as a whole, Singapore has revised the official growth forecast for 2009 to between minus 6.0 to minus 4.0 percent. MAS also said that given weak demand and easing domestic costs, inflation for the year is expected to come in between minus 0.5 percent and plus 0.5 percent. Going forward, the central bank says it is aiming to strengthen Singapore’s financial system, of which one of the measures is to enhance the MAS standing facility to provide liquidity to financial institutions, adding that it will also review and intensify its supervision on financial institutions in the sale of investment products. MAS also said it will continue to keep a strong balance sheet. It has increased its total capital and reserves to 28.74 billion Singapore dollars (about 20 billion U.S dollars), representing close to 11 percent of MAS’ total assets, to help Singapore navigate through a potentially volatile financial market environment and to help stabilize its financial system should the need arises. TOC note: The chairman of the MAS is Senior Minister Goh Chok Tong.